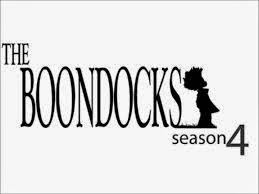 Controversial "cartoon" "The Boondocks" originated by Creator Aaron McGruder is Back! However he did not write this last Season of "The Boondocks" so lets check out how that turned out with the first Episode of the final Chapter...Click the picture above to view! Note: "The BoonDocks" is not for the faint of heart. It took me a minute to get used to the "nonsensical" sense so to speak of writer Aaron McGruder, just hoping the show doesn't lose its intelligent satire now that he is gone.